D-glucuronolactone, also known as D-glucuronic acid or DGL, is naturally made in our bodies when glucose metabolizes in our liver. It is also an important component of our connective tissues. Although DGL is produced naturally (it is a part of our various tendons, ligaments and cartilage), very small amounts of DGL are found in our bodies. D-glucuronolactone is also present in animal connective tissues, certain plants and energy drinks. Because of its many benefits, DGL is a powerful supplement that enhances physical and mental functions of our bodies. DGL have been heavily studied in the numerous products that contain it — particularly sports and energy drinks (x). In many of these studies, DGL is combined with other active ingredients like caffeine and taurine. However, D-glucuronolactone still gets credit for the improvement of several bodily functions. When taken regularly, DGL supports cardiovascular health. It acts as a protectant for our blood vessels by regulating platelet functions. By acting as an anti-platelet aggregative compound, DGL keeps excess platelets from sticking together, which decreases the chances of a heart attack or stroke (x). Glucuronolactone is a component of chondroitin sulphate, a well-known supplement used for joint health (x,x). This is no surprise, because DGL contributes to the structure of our tendons, ligaments and cartilage. These structures support our bones. Since DGL is a part of these supportive structures, it is possible that glucuronolactone may contribute to joint and tendon health. When combined with other ingredients such as taurine and caffeine in energy drinks, DGL enhances an individual’s momentum to carry out daily tasks (x,x). Anyone can find value in this supplement because it provides the one thing that each one of us needs to make it through the day — energy. Intensive exercise typically produces exhaustion and fatigue. However, several trials show that DGL helps to prevent effects of energy depletion, even after vigorous activity (x). D-glucuronolactone will give you that burst of energy to persist and carry any workout or strenuous task. Glucuronolactone contributes to numerous benefits for physical performance, as it is an active ingredient that aids in improving aerobic and anaerobic performance (x). Some people need help to get through an aerobic, high-cardio workout. Labored breathing during an (anaerobic) high-intensity interval training (HIIT) workout might also require a bit of reinforcement. D-glucuronolactone provides support for both. Glucuronolactone also works well with other ingredients as a pre-workout supplement because it leads to the gain of muscle protein and the ability to perform repetitious workout tasks (x, x). Many athletes work to build stamina and strength because their long-term goal is to gain muscle. 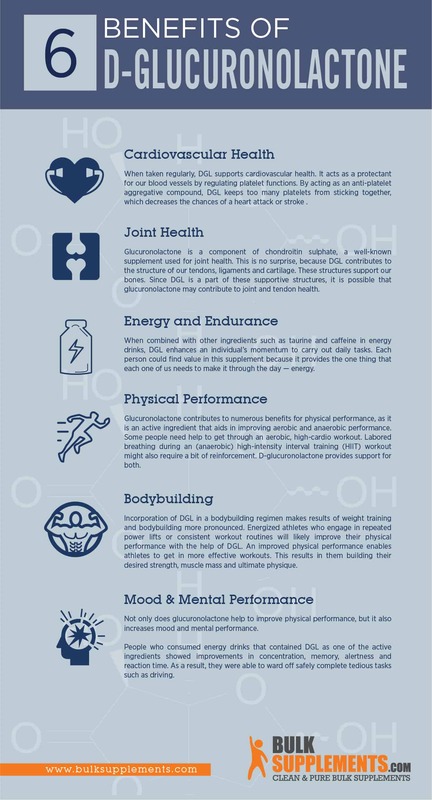 D-glucuronolactone provides benefits that helps athletes to accomplish all of these goals. Those who incorporate exercises to increase cardiac health and trim fat into lean muscle will likely consider glucuronolactone a necessary addition to their athletic routine. Incorporation of DGL in a bodybuilding regimen makes results of weight training more pronounced (x, x). Energized athletes who engage in repeated power lifts or consistent workout routines will likely improve their physical performance with the help of DGL. An improved physical performance enables athletes to get in more effective workouts. This results in them building their desired strength, muscle mass and ultimate physique. 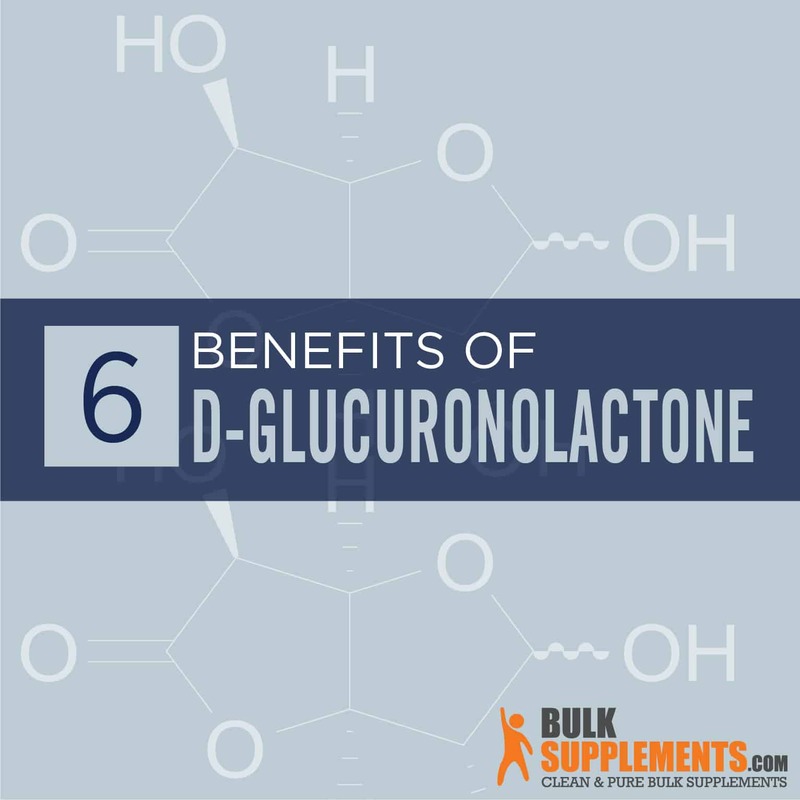 Not only does glucuronolactone help to improve physical performance, but it also increases mood and mental performance. People who consumed energy drinks containing DGL showed improvements in concentration, memory, alertness and reaction time (x). In addition, DGL helps people to feel better about their overall well-being (x). The small amount of DGL inside our bodies assists with normal bodily functions. Individuals seeking to amplify the benefits of DGL depend on products with the highest, most potent levels of the nutrient. They either buy energy drinks that include DGL or dietary supplements. Should you choose energy drinks or dietary supplements to regularly incorporate into you regimen? Both have been reported to give similar results — that is, produce benefits of DGL. Most research about DGL was conducted using energy drinks. Enhancements of energy drinks are well studied and documented. However, energy drinks contain a number of other ingredients that may impose adverse effects on our bodies (x). On the other hand, a natural dietary supplement that contains 100 percent DGL has no other ingredients. Choosing the all-natural alternative is best. Not only are you getting total benefits of energy, mental focus and physical performance from this all-natural supplement, but you do so without the risk or possible interference of other processed ingredients. The recommended daily dosage of DGL is around 1,000 mg one to three times daily (x) (x). Since DGL is so common in energy drinks, any side effects reported may relate to the cocktail of ingredients included and not specifically to DGL. No negative effects of DGL have been reported from individuals who have taken the recommended dosage. DGL is safe to consume under the provisions of the Dietary Supplement Health and Education Act of 1994 (x). While it is safe, though, it is best to consult with your doctor before adding DGL to your regimen. Avoid this supplement if you are pregnant, nursing or under the age of 18. People with medical conditions should consult their physician before taking this supplement. D-glucuronolactone provides numerous benefits to our bodies including sharper mental focus, enhanced physical performance and a more positive outlook. Some people choose DGL in the form of energy drinks. However, an all-natural dietary supplement will yield the same benefits without risking adverse effects of additional ingredients that are present in energy drinks.